In 1787. . . We were given the right to practice the religion of our choice. We were given the right to say what we wanted without persecution. It was written that our house and property were secure from unreasonable search and seizure. We were given the right to a public trial. Fifty-five men we will never know sat in a sweltering room and fought for us. We were given our rights as citizens of the United States. Every second fall, as we return again to the ballot box to decide the course of our country's leadership, every voter must find their way back to that room in Philadelphia. Welcome Books is proud to provide a map. 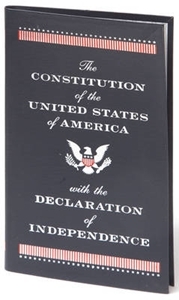 The Constitution of the United States of America, inscribed and illustrated by the master calligrapher, Sam Fink, brings to life the issues underlying the triumphs of this abiding document. Originally published in pen and ink for Random House in 1987, Mr. Fink has gone back to his original black-and-white art and painted it anew, created a full-color masterpiece. The result is glorious. Each amendment, each article, each word so thoughtfully placed in The Constitution has been given Mr. Fink's profound touch. With a powerful intelligence and a wonderful sense of humor, he has provided us with an entry point into this complex document, allowing us to read it with greater ease and understanding. As well as a trade edition, Welcome Books is honored to present a full-color limited edition of 64 loose folios, each 15" x 22," exquisitely designed and produced--matching in its manufacture the stunning quality of Mr. Fink's ambition and the gravitas of the original document. In 1787, we were entrusted with our most important living document, The Constitution of the United States of America. Have we kept it safe? To answer this, we must begin by reading it, each and every one of us--so that we may claim our own intimate knowledge of its content; so that we may never forget its tenets; so that we may remember the kind of world we want to live in. This, Sam Fink, in his direct and unadorned way, respectful and loving, helps us do.